What are the admissions criteria for Shepherd Pathways? How do I schedule an appointment at Shepherd Pathways? Does Shepherd Pathways take patients with behavioral issues? Does Shepherd Pathways have a residential program or offer housing? What are the operating hours for Shepherd Pathways? When will I be admitted to Shepherd Pathways? Can I attend all of the therapy sessions with my loved one? What should I do to be prepared for my first day at Pathways? What do I need to bring for daily therapy? Where can I go to discuss my hospital bill? What do I do if I need disability papers filled out or need a letter sent to an employer or insurer? How will I know if Pathways is closed due to inclement weather? Will I be working with the same therapists every day? What do I do if I have an emergency outside of therapy hours? Shepherd Pathways' post-acute program treats patients with traumatic or non-traumatic brain injury, as well as stroke patients. We also offer services to those who have the dual diagnosis of brain and spinal cord injury. Patients must be medically and behaviorally stable and be able to tolerate three to five hours of therapy a day depending on the program in which the patient is enrolled. To schedule an appointment at Shepherd Pathways, please call our admissions department at 404-350-7602. Yes, we take patients with mild to moderate behavioral issues that are not at risk to harm themselves or others, or be too disruptive to the other clients, i.e. yelling, cursing loudly, screaming or engaging in any sexually inappropriate behavior. For additional resources regarding neurobehavioral programs, contact the Brain Injury Association of Georgia at www.braininjurygeorgia.org or Brain Injury Information Center HelpLine at 1-800-444-6443. The Residential Program is available for patients who require full supervision and cannot live alone or with family. Visiting hours are 4 to 10 p.m. weekdays, 10 a.m. to 11 p.m. Saturdays and 10 a.m. to 10 p.m. Sundays. Family and friends are encouraged to visit, but overnight visits are prohibited. If needed, your assigned case manager can assist you in locating local lodging alternatives. Complimentary housing for Shepherd Pathways Day Program patients and families is available for a limited time to families and Day Program patients referred directly from Shepherd Center's inpatient rehabilitation program if both the patient and family live more than 60 miles from the hospital's main campus in Atlanta. Shepherd Pathways’ hours are 8:30 a.m. to 4 p.m. Monday through Friday. When you come to Shepherd Pathways, you will receive a thorough assessment, conducted by the physician and your treatment team. Your case manager will help coordinate your care with your rehabilitation team so that you reach your rehabilitation goals. 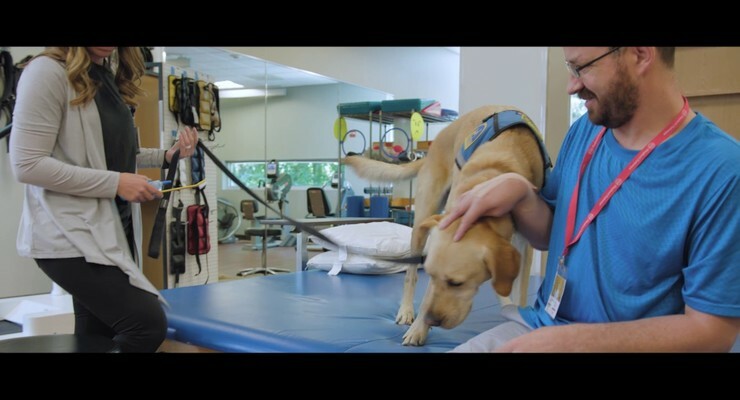 This team may include physical, occupational, speech and recreation therapists, a nurse, neuropsychologist, rehabilitation counselor, a vocational specialist, life skills trainer and rehabilitation technician. Upon completion of your therapy evaluation, the treatment team, in collaboration with you and your family, discuss recommendations and if indicated will establish treatment goals and an estimated length of stay. We strive to provide timely service to all of our patients. At times, we do have a waiting list. If you do not wish to wait for an opening, we will be glad to provide you recommendations for other facilities that may be able to meet your treatment needs. We ask family members or caregivers to accompany the client on their first day of treatment, as well as scheduled family trainings and/or conferences. Pathways has an open-door policy, and we encourage families to observe treatment sessions as you are able. At times you may be asked to step out of a session if this poses a distraction for the client or if the client is undergoing formalized assessments. Due to various reasons, you will not be able to attend all groups, even if they occur in the client's schedule during a training day. Staff can direct you as to which groups are open to families and caregivers. We also offer family education and support groups during the therapy day that are highly recommended for all families. Yes, all clients should have an established primary care physician (PCP). It provides you with a physician who can address any medical need and oversee your medical care. Pathways physicians do not treat clients for medical issues or concerns not related to their injury (e.g., flu, strep throat, etc.). If you do not live locally, you may at times have to go to an urgent care center to have these issues addressed. For continuity of care, your medical record can be forwarded to your primary care physician or other providers upon discharge, at your request. If your loved one is currently an inpatient at Shepherd Center, please speak to your assigned case manager. All other patients can contact the admissions department at 404-350-7602. If you utilize a Hoyer lift for transfers, please put your sling under you. Please bring an extra change of clothes in case you need them. Lockers are provided. If you would like to lock the locker, please bring a pad lock with you. Each day, you will need to bring any medications you will need to take during your therapy day, bowel and bladder supplies, a change of clothes, and any equipment needed to complete your therapy (e.g., splints, walking devices, cognitive prosthetics, wheelchair or any adaptive equipment you may use). Nursing staff is available to provide supervision for medication needs during your therapy day. If you require a nurse to administer your medications during the therapy day, please speak with your inpatient case manager or your admissions coordinator prior to your admission. Refrigerators and microwaves are available, and staff members are able to assist you with meal preparation, as needed. To obtain medication refills, please speak to your team nurse. Please provide the client’s name, date of birth, the medication and dosage required, and the phone number for the pharmacy where you want to pick up the medication. We also need a contact number to reach you if there are any questions. Please allow up to 24-48 hours for most prescription refill requests. It is important to provide several days of notice for your needed refills so that you do not run out of your medication. You may ask the nursing staff about your lab results at any time. In general, if all lab results are within normal range, you will not be notified by the nursing staff or the physician. If an abnormal result is found, the nursing staff will call you with results and physician instructions. Shepherd Center has a financial counselor who is available to discuss your questions or concerns. The financial counselor can be reached at 404-350-7323. A medical records release authorization form is available for download here, or you may contact the Health Information Management Department at 404-350-7325. Please provide your assigned case manager with any forms that need to be completed. The case manager will assist in ensuring these forms are completed and returned to you in a timely manner. If there is inclement weather, please call 404-248-1667. A recording will be available informing you if Pathways will have a delayed opening or will be closed for the day. Also, you may want to check Shepherd Center's website. You will be assigned a primary therapist and team. Depending on what program you are attending, you will be scheduled for individual and group-based treatment. Your primary therapist will collaborate with you to guide your treatment plan and goals. You will also be treated by other therapists and rehabilitation technicians who will be familiar with your treatment plan and care needs. Having a variety of staff members working with you will allow you to benefit from the variety of their expertise and experience. For outpatient and Day Program patients, if you have an emergency situation after therapy hours or on the weekends, please call 911 or go to your local emergency room or urgent care center.